Cadbury has released the latest short film from the Glass and a Half Full advertising campaign. 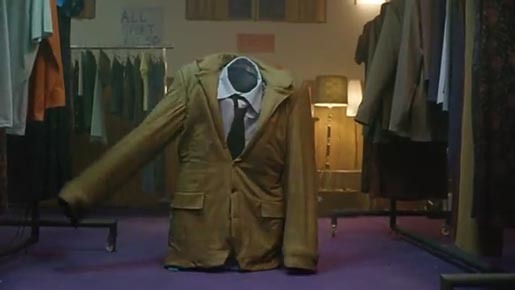 “Charity Shop”, The 90 second ad features second-hand shirts, dresses and trousers dancing to the 1980s Jermaine Stewart track, “We don’t have to take our clothes off”. Julie Reynolds, marketing manager for Cadbury Dairy Milk, said: “For us Cadbury Dairy Milk is about creating moments of joy that make people smile. We believe this production is another great way of doing just that.” Cadbury’s campaign invites dancers all over the country to join the dance-off on youtube.com/cadburydanceoff. The Charity Shop ad was developed at Fallon, London, by executive creative director Augusto Sola, creative Sam Hibbard and agency producer Sasha Mantel. Filming was shot in Prague by directing group Megaforce (Clément Gallet, Raphael Rodriguez, Charles Brisgand, Léo Berne) via Riff Raff Films with producer Matthew Fone, director of photography Lasse Frank, production designer Petr Kunc. The commercial was shot in an oversized set, where dancers wore double scale clothes and performed the choreographed moves. Local production was provided by production designer Peter Kunc at Unit + Sofa, Prague. Sound was designed at Wave Studios by sound engineer Parv Thind. Media was handled at PHD by Katrin Schlenka.